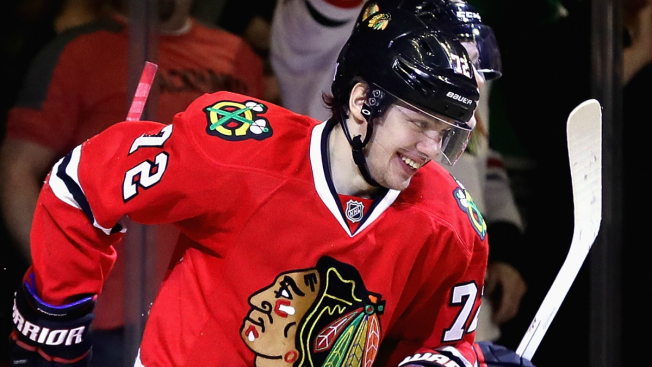 Artemi Panarin #72 of the Chicago Blackhawks smiles after scoring a third period goal against the Colorado Avalanche at the United Center on November 3, 2016 in Chicago, Illinois. Outside of winning a Stanley Cup, the best news that a Chicago Blackhawks fan could receive before next summer may have been delivered on Wednesday afternoon. Superstar forward Artemi Panarin has agreed to a contract extension with the Blackhawks, according to multiples report, meaning that forecasts of doom and gloom surrounding his status on the team for next season can finally be put to rest. The Athletic Chicago’s Scott Powers initially reported the extension, which Mark Lazerus of the Chicago Sun-Times corroborated a short time later. Financial terms of the deal were not initially disclosed, but according to TSN's Bob McKenzie, the new deal is for two years at $6 million per season. In 117 NHL games, Panarin has already scored 45 goals and dished out 69 assists, and he easily won the Calder Trophy as the league’s top rookie during the 2015-16 campaign. If possible, Panarin might be even more impressive this season. Even going through stints without Patrick Kane opposite him on the ice, Panarin has still established himself as one of the best scorers in the league, and he is averaging a point per game through the first 37 contests of the year. With Panarin back in the fold, the question for next season is whether the Blackhawks will have to say goodbye to one of their star players. Speculation has been rampant that a Panarin extension could spell the end of the Brent Seabrook or Corey Crawford eras in Chicago, and once we find out the cap implications of Panarin’s new deal, those rumors will only continue to swirl.